Did you know that Detroit is the only US city located NORTH of Canada? Don’t believe us? Google it. This was just one of the tidbits we learned while traveling to Michigan last week to experience an amazing city neither of us had ever thought much about. Another thing we discovered – it is resilient as hell. If you’re new here, Marlo (boss lady) was born and raised in Detroit. In 2014 she was invited to attend the city’s first ever Homecoming, which has since become a yearly event that reconnects attendees with their hometown and helps them to understand how it will continue to serve as a hub of innovation. After her trip in 2017, Marlo decided it was time to share the history and future of Detroit with colleagues and business professionals alike. And, just like that, planning for #marloinmotown commenced and we booked our flights. It’s hard to believe that since that day, the trip has come and gone. We had a great time, made new friends and learned so much about Detroit, its history, the SUPER friendly people that live there and future plans for the city. With all that said, we wanted to share a few of our favorite parts of the trip with you all. For us, Eastern Market represented the soul of Detroit and its hard working residents. Since opening in the 1800’s, the Market is essentially an infrastructure that supports the city’s unwavering mission to enrich Detroit—nutritionally, culturally and economically. 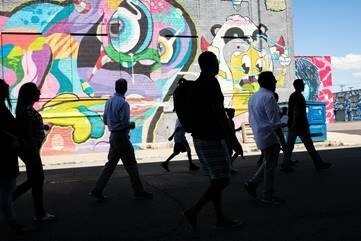 We toured this area of Detroit early on in the trip, chatted with vendors, tried amazing foods and saw incredible murals that had been painted by local artists. We loved it so much that we went back before heading to the airport. If you’re visiting Detroit – go here. I’d say it was day one when the group learned of a decades-long family competition for the title of best coney in Detroit. If you don’t know what a “coney” is, don’t worry – we didn’t either. Essentially, it is a loaded hot dog, smothered in delicious, fatty goodness. 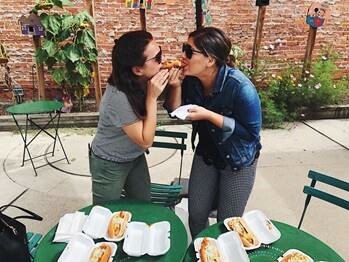 Almost immediately we headed to American and Lafayette Coney Islands (conveniently located next door to each other) to try these famous dogs for ourselves. If nothing else, go to Detroit right now and eat these. They. Are. Amazing. Lafayette is the CLEAR winner for us, but we’ll let you decide for yourselves. The name Shinola is no stranger to us – our agency helped open the Boston store a couple of years ago and we’ve all been hooked ever since. When we saw that touring the factory was on the itinerary, we were both ecstatic. For a bit of background, Shinola is an American luxury-goods brand that produces watches, bicycles and leather goods, among other products. It was founded in 2011, and its name, we learned, is a nod to the defunct Shinola shoe polish company that operated in the early- and mid-20th century (ever heard the saying “you don’t know sh*t from Shinola?”). 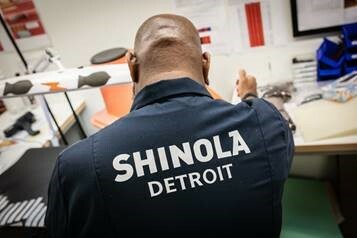 The tour itself was so informative, and learning how Detroit locals craft each component of a Shinola product to perfection was amazing. These individuals take so much pride in their work, and it was truly inspiring to meet the faces behind the watches. We could have gone on and on and on, but then you’d have no reason to visit Detroit! We hope you enjoyed this brief snapshot of our amazing trip. 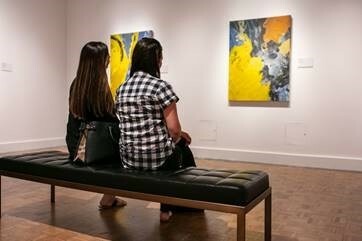 Don’t hesitate to reach out if you’re considering a weekend getaway to Motor City!